This is not going to be your usual funeral homily, but Archbishop Hunthausen was not your usual bishop, was he? And I know: a homily is supposed to break open the scriptures and shed light on them. But Archbishop Hunthausen’s very life was a homily on those scriptures. His life was a courageous prophecy. His life was a Gospel. He put a human face on each of those Beatitudes we just heard. Pope Francis, in his Apostolic Exhortation Gaudete et Exsultate, tells us that we find a portrait of the Master in each of the Beatitudes. Yes, and I would say that we also find a portrait of our friend, “Dutch,” in each of them. So I hope you will bear with me if, instead of the usual funeral homily, I simply tell a few “Dutch” stories that shed more light on the Beatitudes than any words of mine ever could. My first story goes back to May 22, 1975, the day our friend was installed as Archbishop of Seattle. Those of us of a certain age probably have memories of that day – of the hope and joy we felt in welcoming our new archbishop. My memory is of the homily. Well, not so much the homily itself—who remembers homilies after all? My memory is of the lead-up to the homily. When he stepped up to the podium on the stage of the Civic Auditorium, Seattle’s new archbishop paused briefly and asked an overflowing crowd to join him in some moments of quiet prayer, asking the Holy Spirit to inspire him in what he was about to say. In the long silence that followed, you could have heard a pin drop, and I remember thinking to myself: this is new! And it was. We were used to bishops who knew exactly what they were going to say and said it, bishops who had a certain confidence that God told them what to say. Here was a bishop who thought the people might have some say in what he was about to say—the people and their prayer! That moment long ago reminds me of a memorable moment in March of 2013, when the newly-elected Pope Francis stood on the balcony of St. Peter’s, humbly bowed his head, and asked the whole world to pray for him and to bless him. All of this brings to mind the first Beatitude: Blessed are the poor in spirit, for theirs is the kingdom of heaven. It is only the poor in spirit, after all, who know how much they need the Holy Spirit. That’s true of Pope Francis, and it was also true of our friend Archbishop Hunthausen. For him, it was always about being open to the Holy Spirit, which meant being open to God’s holy people as channels of that Spirit. We know, of course, that Church leaders are channels of the Spirit—that God speaks through them. But God also speaks through the people in the pews—through their needs, their hopes, their challenges, their dreams. So the Archbishop’s first homily set the tone for everything he did during his years in Seattle. From Day One, he made it clear that he would be listening to the Spirit speaking through God’s people. All God’s people. Archbishop Hunthausen always maintained that he got his on-the-job training for being a bishop at the Second Vatican Council. He arrived at the Council with all the episcopal trappings: cassock and cape, miter and mozetta, biretta and buskins; he left the Council wearing a simple black suit and driving a Volkswagen -- a different man, a converted man, if you will, a man convinced that the people, all God’s holy people, were the Church; a man convinced that the Church could learn as well as teach; and that the world was best seen as friend, not enemy – rich in potential, flawed yet flowing with grace, charged with the very “grandeur of God,” in the words of the poet. And so, on that evening so long ago, when our new archbishop asked us to pray for him, it was his way of saying that he needed us, respected us, and would listen to us. And he did. For sixteen incredible years he led us by honoring our holiness -- walking with us, consulting us, challenging us, collaborating with us, celebrating with us. I have often heard it said that there’s something special and unique about the Church here in Seattle. There is. And we know why. We had a bishop whose own holiness was connected to the holiness of his people--which brings to mind another beatitude: Blessed are they who hunger and thirst for holiness, for they will be satisfied. A third story. This one comes from 1986. The Seattle Visitation was front-page news around the country and the bishops of the country were assembling for their November meeting in Washington, DC. The stakes were high. After several years of a wearying, dispiriting hanging-out-to-dry of this local Church and its archbishop, matters had come to a head. At the highest levels, the Archbishop’s leadership had been called into question and he was no longer considered capable of leading this Church by himself. The people, however, (religious, priests, deacons, lay)—most of the people saw it differently. They loved their archbishop, supported and revered him, believed in him. It was a tense time and a terrible time. The eyes of the country were on Seattle. The bishops’ meeting held some hope, no matter how fragile, for resolution. A couple of us travelled to Washington with Archbishop Hunthausen for that meeting, and I remember sitting together on the plane. And I also remember that, joining us, purely by chance, was the chair of the theology department of Notre Dame University, Fr. Richard McBrien. He had been at St. Martin’s University in Lacey to give a lecture the night before. As you can probably imagine, our conversation during the flight was rather animated! Before we knew it, we had arrived in Chicago where we had to change planes. When we stood up to exit the plane we experienced the usual inertia, the bottleneck when everyone is eager to move to the exit but no one can. In the midst of that, a fellow who had been sitting in front of us turned around abruptly and thrust a piece of paper into the archbishop’s hand. “Here!” was all he said, but he said it with as angry and hostile an expression on his face as I’d ever seen. “Do you I know you?” the archbishop asked him, smiling his disarming smile and extending his hand. There was no answer and no hand was returned. There was only a handwritten page filled with venom and vitriol and a devastatingly personal attack on the archbishop. Our friend quietly folded up the note, put it in his pocket, and remarked to us, as the fellow disappeared into the crowd, “Oh, I wish we could sit down and get to know each other. Maybe we’d come to understand each other and be friends.” I hasten to assure you that my sentiments at that moment were far less generous! Story four. Pardon me for jumping around chronologically. This story is from April of 1982. The archbishop was scheduled to speak before the regional synod of the Lutheran Church at Pacific Lutheran University in Tacoma. The day before, he shared with me the talk he planned to give, asking for my comments. The talk was fairly predictable – until it came to the part about withholding one-half of his federal income taxes as a protest against the nuclear arms race. My heartbeat accelerated and my blood pressure—shall we say?--elevated. I told the archbishop that I thought it was a great speech but I questioned the passage about withholding his taxes. True to form, he thanked me and told me he’d pray about it. The next morning he told me he had prayed and was more convinced than ever that he should leave that part in. I knew at that point that there was nothing left for me to say, so I told him I would prepare a press release. “Why would you do that?” he asked. “No one is going to be interested in what I say.” On the contrary, I told him, it would be (pardon the militaristic reference) “the shot heard round the world!” And it was. As it should have been. And I should have been a little less fearful; no, a lot less fearful. Thank God he listened to the Holy Spirit, to the Gospel, and not to me! Story five. I only know this story because the archbishop told it to me. It goes back to August of 1945. To August 6, to be exact – the day we dropped the atomic bomb on Hiroshima. Dutch Hunthausen was at St. Edward’s Seminary in Kenmore, a year away from ordination. Because of the war and the pressing need for priests, seminarians were on an accelerated path that involved their remaining at the seminary during what should have been summer vacation. When word reached St. Edward’s about the Japanese bombing there was general jubilation. The enemy was finally vanquished. But that was not the way that Dutch saw it. He could only think of the 70,000 people who had been incinerated in a matter of seconds, and he shared with me how he went off to the woods for a walk, and then to the chapel, where he buried his head in his hands, and wept. Story six. It was late fall of 1973. The Archbishop of Portland was about to retire. A call came to Bishop Hunthausen at his office in the Chancery in Helena. Not just any call. It was Archbishop Jean Jadot, the Apostolic Delegate, calling from Washington, DC. “The Holy Father would like you to go to Portland as Archbishop,” he told him. Some moments of silence ensued. Then our friend expressed amazement and asked if he could have some time to think and to pray. The time was granted--I’m not sure how much--but I am sure that the praying was intense. At the appointed time, our friend called Archbishop Jadot and shared with him his deep and prayerful conviction that the appointment to Portland was a step too far—that he believed it would not be the best thing for the Church, and that, if the Holy Father would allow it, he would respectfully decline. Story Seven. This story comes from 1987. In order to understand it, you need to know that one of the things the archbishop had been called to task for during the Apostolic Visitation had to do with his supposed permissiveness with regard to Church regulations about who can receive the Eucharist. He wasn’t permissive, but he was a pastor, not a policeman. Well, the Visitation had finally concluded. The Archbishop had been given back full authority to govern and Thomas Murphy had been given to him as his Coadjutor. In order to formally bring the whole sorry saga to a close, both archbishops travelled to Rome for an audience with Pope John Paul II. The plan was for the two of them to concelebrate Mass with the Pope in his private chapel and then to have breakfast with him. As it turned out, the two archbishops were not the only honored guests at Mass that day. Standing in line with them at the entrance to the Pope’s chapel was the noted American author, James Michener. I’m not going to leave the story there, because it doesn’t begin to tell the whole story of how the Archbishop related to Cardinal Ratzinger and Pope John Paul II. True to form, he was always completely respectful and he agonized greatly over the perception on the part of some that he was a maverick out to start a revolution. He always maintained, and rightly so, that it was his pastoral leadership that had been called into question, not his doctrinal fidelity-- pastoral leadership -- carried out in fidelity to the gospel and Church teaching, and in response to the reforms of the Second Vatican Council. But thank God for his humor, the kind of humor evidenced that day in Rome. His humor, along with his humility, and a faith stronger than any I’ve ever witnessed—got him through some excruciatingly painful and difficult years. Last story. It was January of 2011. The bishops of the northwest were making their annual retreat at the Palisades Retreat Center. Father John Canary, the Vicar General of the Archdiocese of Chicago, was the retreat master, and our friend was there and happy to be. But he was struggling with something that had been bothering him for some time. For years, in fact. The struggle was over where his funeral should be held and where he should be buried. It was a classic Hunthausen conundrum brought about by two competing values. Well, maybe more than two. There was his family – his huge and beloved family – in so many ways the light of his life. And there was Montana – Anaconda, Montana, to be exact – the place where he grew up with his mom and dad, and his sisters and brothers – all six of them. And there was that simple bare hillside cemetery overlooking Anaconda where his remains could rest peacefully – and not too prominently – alongside a whole host of Hunthausens. That was one choice he could make, and clearly the choice of his heart, a choice consistent with who he was and how he saw himself. The competing value had to do with his calling, his ministry in the Church as shepherd, the important office he held for so many years, sixteen of them here in Seattle. With that office came expectations and traditions and the reality of a family far larger even, than the great and larger-than-life Hunthausen clan. Tradition called for his funeral and burial to be among the people he served as archbishop. It wasn’t a mandate, mind you, but it was something of an expectation. Thus the quandary. As the retreat unfolded, the Archbishop realized that the retreat master, Father Canary, was someone whom he could talk with, someone whose judgment he could trust. So he asked him for a chance to visit. During the visit, the Archbishop shared with him the struggles and uncertainties I mentioned, and after a while, Father Canary looked him in the eye and said, “You know what I think? I think you’ve already decided what you should do.” And the Archbishop thought for a moment and said, “You know, you’re absolutely right!” And that was that. He later shared with Archbishop Sartain and with me his decision to have his funeral in Seattle and his burial in the crypt of St. James Cathedral. Once more, the humble, thoughtful man of God, the gentle shepherd who always prayed to do what was right, had found his peace in the way he always had: by prayerful discernment, and by putting his calling and its demands ahead of his personal preferences, no matter how strong. There are so many more stories to tell about our friend. But I’ve talked too long already. Let me conclude with a little story of my own. During that fateful November, 1986 meeting of the Bishops’ Conference in Washington, DC, I had a long and memorable conversation with Bishop William McManus, the bishop of Fort Wayne-South Bend, Indiana. 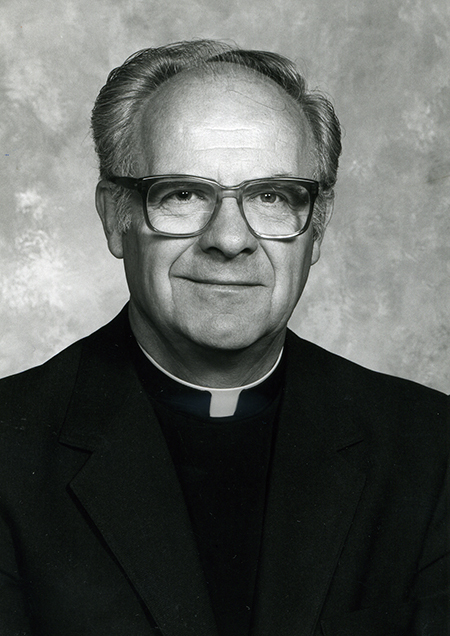 McManus had been a Chicago priest and had served for years on the staff of the national Bishops’ Conference. He was a highly respected educator and an avid student of American Church history. During our conversation, he shared with me that in two-hundred years, he thought the American Church had produced a number of truly fine bishops, but only the tiniest number of really great bishops. He named only three. Two were from the late 19th and early 20th centuries: Cardinal James Gibbons of Baltimore, and Archbishop John Ireland of St. Paul. Both men made their mark by, among other things, helping to overcome a deeply-held Roman conviction that the Church couldn’t really flourish in a democratic, pluralistic republic like ours. The third really great bishop, McManus said, was Raymond G. Hunthausen. Not bad company. “Let others tell of the many; I would tell of the few. I am tired of the common. The common never puts humanity forward, never begets a great movement; nor does it save humanity when grave peril threatens. The common! We are surfeited with it! The want in the world, the want in the Church, today as at other times, but today as never before, is for leaders who see farther than others, rise higher than others, act more boldly than others. They need not be numerous. They were never numerous. But, while few, they take with them the multitude and they save humanity!" Dutch, dear friend, common you were not, although you surely had the common touch. And you did see further than others. You rose higher than others, acted more boldly than others, and yes, you took with you the multitude: you took us, and so many others. What a gift you were to us! You taught us -- more by who you were than by what you said; you led us, walking alongside us and never lording it over us; you inspired us to be our best selves and never to take shortcuts around the gospel; and you challenged us to dream great dreams and to believe that nothing is impossible for those who believe. Blessed are you, dear friend. Blessed are you. Yours is the Kingdom of Heaven!